You know how sometimes your eyes are bigger than your stomach? How you know you shouldn't eat several pieces from the bottomless bread basket at a restaurant, then order appetizer, side salad, main course, and dessert, but everything looks so tempting you can't say no? Then you experience growing pains in your stomach. A similar thing happened to me when my friend who works for Volunteers of America let a few of us in on some free offucts that had been donated to the organization but which didn't sell. They needed to get rid of it in order to make room in their storage unit. No problem, I'm always happy to help a buddy. So my friend, Scott, and I took his truck to the VOA site and started sifting through piles of plywood, mdf, pine, and a few pieces of hardwood. 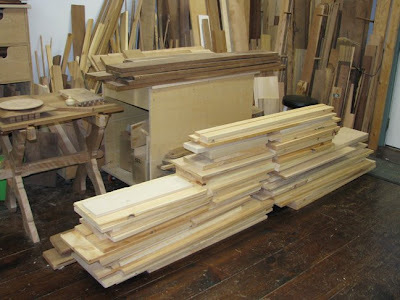 Most were small pieces, but as woodworkers we can always talk ourselves into reasons why we should not pass up free wood—it's just too tempting. Surely we can find a use for it, otherwise, it will just end up in some landfill, right? By the time we finished rifling through the piles, we had completely filled his truck with lumber. I chose mostly pine, which we unloaded outside my shop, and he headed home. Later that week, after I had stowed the wood in my shop, Scott came over, walked in, looked around with a puzzled look on his face and said "Is your shop getting smaller?" He didn't know what was different, he just knew my shop seemed to be more "stuffed." And so it was—my eyes were bigger than my workshop and now I'm experiencing growing pains.